What is white light? In the OliNo lamp measurement articles a chromaticity diagram is given and the color point of the light of the tested lamp is indicated. The chromaticity diagram contains all possible colors, and which are white? In OliNo lamp meaurement articles the color point of the light tested is given in the chromaticity diagram. 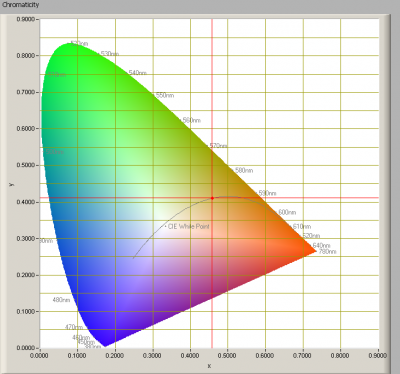 More information on the chromaticity diagram can be found on Wiki. The first example of the chromaticity diagram shows the color point of the light of a tested lamp, with its position on top of the Planckian locus (this locus indicating color points from light from perfect radiators or black bodies). So that might be white. But is it white according to norms? Is there a norm anyway? The second example shows a color point that does not lie on top of the Plackian locus. But is it white light? There are more color points possible and the question remains; what is considered white? The CIE standard “Colours of Light Signals” (CIE S 004/E-2001) defines the area in the chromaticity diagram that belongs to white light. The norm is applicable to the colors of signal lights used in road, air, sea and rail transport including signal lights on ships, aircraft, motor vehicles and trains, where the recognition of the colors involved is essential. The standard shows the allowed areas in the chromaticity diagram for the different signal colors: red, yellow, green, white and blue. Generally for OliNo lamp measurements white light is expected, and so a reference can be maid to the defined areas for white signal light. The standard differentiates in white light for class A and for class B. Class A is about signaling systems that do also apply yellow light; as a consequence the allowable color are for white signal lights is smaller than in class B. The latter is about signaling systems without the yellow color and so the white light might come from a wider color area as it will not be confused with yellow light. The left-bottom in black indicated area is the only allowable area for white signal light according to class A. The light for signal lamps is allowed to come from both areas if class B is allowable. OliNo puts these two areas in the chromaticity diagram together with the color point of the light of the tested lamp. See these two examples of color points of light of tested lamps, and their position in the chromaticity diagram with respect to the two areas for white signaling lights. In the first example the light of the tested lamp is in class B. In the second example the light of the tested lamp is in class A. There are also possibilities that light from a tested lamp is outside these areas. Using a standard for signal lights a reference is made for the color points in the chromaticity diagram of the lamps tested by OliNo. The standard and the allowed areas are applicable only to light with a signaling function and not light used for general (indoor) illumination use. There is for general (indoor) illumination use to the knowledge of OliNo no standard or norm (yet). Since this standard is about recognition of the color of light, and it also defines clearly the relevant color area in the chromaticity diagram, it is used as a reference (indicative) for the color positions of the measured lamps. The areas do not indicate what cold or warm white light is, this is indicated by the (correlated) color temperature. The areas also do not indicate the light’s capability of rendering colors well, for that the color rendering index (CRI or Ra) is used. Whether it is allowable for general (indoor) illumination use of white light to fall outside the color areas defined for signal lights is not known. It will most likely depend on personal judgement. The indication of the areas for white signal light in the chromaticity diagram is only to be used as a indicative reference when it concerns light for general (indoor) illumination use.